You should replace the head on your electric toothbrush every 3 months. If using a manual toothbrush, replace that every 3 months too. The brush head on a manual or electric toothbrush is formed of hundreds of bristles that are clustered together to create the brush heads we see today. Some bristles may be shorter, some may be longer, some may be angled and some may come in a variety of colours. Although designed to be repeatedly used, the nylon construction can withstand thousands of repeated movements, there comes a time that those bristles fray, split or are no longer in the tight formation that they once were. Think of them like a tyre on a car, after a certain period they need replacing because they have worn out, the same is true of the bristles on a brush head. It is not a case of waiting until the brush head looks worn out, the wear on the bristles is not always noticeable. The advice from the American Dental Association & health care brand Colgate is every 3-4 months whilst the Oral Health Foundation suggest 2-3 months. 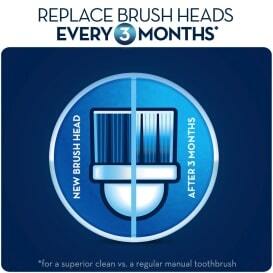 Generally dentists agree that replacing the brush head every 3 months on average is best. Under most circumstances the bristles will normally hold their shape up to around this time. Damaged, frayed or split bristles can actually do more damage to the teeth and gums and certainly will not be as effective when it comes to their ability to clean. Trying to remember when you last changed your brush head can be difficult. Ideally you would mark it on the calendar or set a reminder when it is time to change, but not many of us will do that. Whilst you do not need to be a genius to know when to change your toothbrush or indeed notice that it might be time to change, many brush heads now help you out. On any Oral-B, Sonicare and Colgate toothbrush heads you have so-called indicator bristles. The colour of the bristles start off fuller and darker, but as time passes they become lighter and appear more worn. More often than not, these bristles are blue in colour and fade to white/clear. It is this fade in colour that acts as a guide to tell you to change brush heads. You should also be able to tell when looking at the head too. If there are a number of bristles poking in all different directions and generally not looking as tightly organised as when it was new, then it could be time to change. You do not have to see both discoloured bristles and frayed or split bristles to change the brush head, in many cases the bristles will still be in formation and just the colour had faded. If you chose you can change the brush head earlier than 3 months, in some cases, particularly bad frayed bristles, it might be worth doing. If you have used the brush head for 4 months, it does not matter massively but do look to change it as soon as possible. There are now brushes like the Oral-B Pro 6500, Genius 8000 and 9000 as well as the Sonicare Flexcare Platinum Connected that will actually remind you when it is time to change your brush head thanks to apps that store this data and remind you. The Sonicare DiamondClean Smart goes one stage further. Microchips in the brush head track how long you have been using that head and your brushing technique. When it is time to change it will trigger an LED on the brush handle to light up and remind you. How about having brush heads turn up in the post automatically when you are due a new brush head?! Check out our how to get cheap brush heads post for more information on this. If you prefer to use a manual brush, you can avoid throwing away the entire toothbrush (reducing your contribution to plastic pollution) by using a product such as Boie toothbrush, which has detachable heads and is 100% recyclable. So, whether it is an expensive electric, cheap manual or something in between, change that brush head on average every 3 months, for the good of your oral health.